Oktoberfest is much more than an almost 200-year-old party tradition. In 1809, Princess Therese Charlotte Luise von Sachsen-Hildburghausen was on the short list to become the bride of Napoleon Bonaparte. Crown Prince Ludwig, destined to become King Ludwig I of Bavaria, however, fearing that Napoleon would force him to marry a French princess, quickly chose Princess Therese as his German bride. On December 21 through 24, 1809, he visited Hildburghausen and chose Therese over her younger sister, Luise, who was considered more beautiful. The Delaware Saengerbund and Library Association tells us the wedding took place on October 12, 1810 in Munich, Bavaria. Celebration of the marriage, known as The Oktoberfest, began five days later on October 17. It was held in front of one of the gates leading into Munich, Sendlinger Tor. The festivities included horse racing among many other events. The following year an agricultural fair was added and starting in 1818 the celebration included beer and food tents and performers. Even though the horse races ended after 1938, the other events were held every year except during war time. In 1887, lederhosen for men and dirndls, colorful dresses with close-fitting bodices and full skirts for women, became the traditional Oktoberfest garments. A parade, starting just before noon, opened the fest as it still does today. The Mayor and other civic leaders lead the parade, followed by horse-drawn brewers’ carts, bands and townspeople wearing their costumes. It ends at the oldest private tent of the Oktoberfest, the Schottenhammel tent. There, the Mayor opens the first keg and the partying begins. Millions of people attend the opening ceremonies. Märzen style beer was served at the Crown Prince’s wedding in 1810. 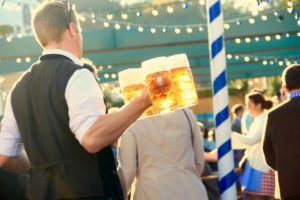 Today, Munich’s six major brewers of the Oktoberfest’s traditional Märzen beer Hacker-Pschorr, Lowenbrau, Spaten, Hofbrauhaus, Augustiner, and Paulaner. The brewers all have tents filled with live music day and night during the 16 days of Oktoberfest and, of course, copious quantities of their product. 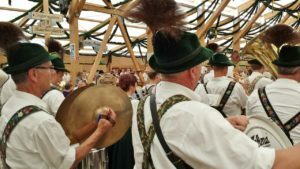 Today, in addition to the beer tents, there are sideshows and carnival rides, music and dancing, and stands selling all the favorite German foods: wursts of all types (beef, veal, pork and chicken), as well as sauerbraten, every type of schnitzel, sauerkraut, red cabbage and potatoes prepared in many ways. Of course, there are pretzels with hot mustard and unusual foods. Fish on a stick anyone? 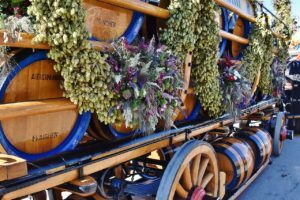 All About Beer Magazine gives the origin of Märzen (March) style beer. Before refrigeration, because of the heat of summer, the last practical month for brewing was March. The freshly brewed beer was then lagered or stored in cellars and caves to mature until ready to enjoy in late summer and the crisp days of autumn. Märzen and Oktoberfest have become virtually interchangeable names for these bottom-fermented, malty, deep gold to coppery biers of autumn. Today, the Munich Oktoberfest starts in September because the weather is milder than that in October. It lasts 16 days and always ends on the first Sunday of October. It has become a great tourist attraction and a great way for folks to learn about Munich, beautiful Bavaria and its people. Over 7 million people attend the opening day festivities alone. Strike up the oompah band and get ready for Oktoberfest! Share your pictures with us on Elfster’s Facebook page, on Twitter @Elfster, and on Instagram @Elfster.